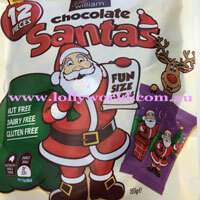 Sweet William Chocolate Santas are nut free, dairy free and gluten free. 12 fun size Santas in each 155g pack. The easy choice when the choice is hard. Sweet William Chocolate Santas are nut free, dairy free and gluten free. 12 individually wrapped Santa shaped fun size chocolates in each 155g pack. The easy choice when the choice is hard.